Oh, hell no. That’s the first thought that came to mind when we laid eyes upon this so-called “door to hell” in Turkmenistan that’s been burning for decades. For some reason beyond our comprehension, people are totally comfortable hanging out in this literal hot spot, with some even daring to dangle their feet over the fiery brim of the natural gas crater that sits in the Karakum Desert. 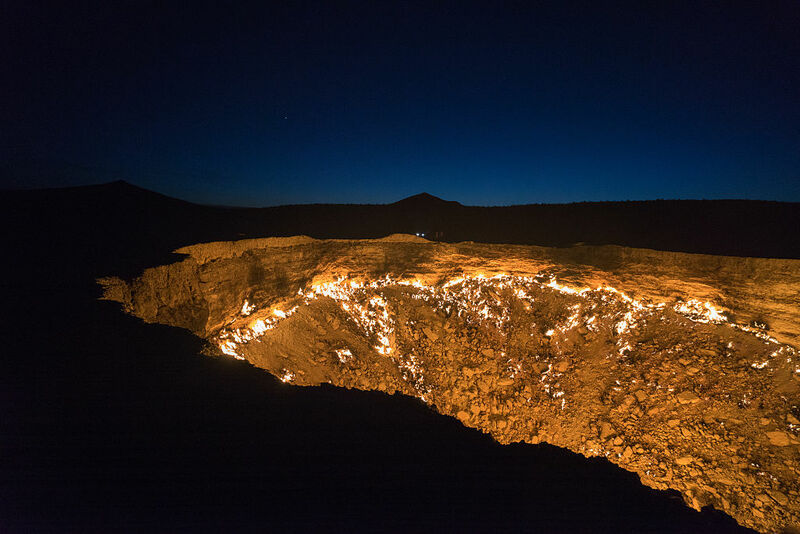 Apparently, this giant hole in the ground has been ablaze for more than 40 years, and brave tourists travel from all over to witness its fiery intensity up close and in person. As Smithsonian Mag details, the backstory behind the subterranean inferno begins in 1971, when a group of geologists started drilling in what they believed to be a pretty sizable oil field. While drilling, they hit a pocket of natural gas which caused the site to collapse, opening several large craters in the ground. As a result, the newly formed gaps in the Earth increased the likelihood of explosions and exposed animals in the area to breathing problems, which eventually began to kill them off. In a prime example of humans trying and failing miserably to clean up their misguided messes, the scientists thought it would be a great idea to simply burn away the gas, which they believed would take a few weeks. And yet, more than four decades later, the gas continues to burn. The lesson in all of this? When you cause a disaster, find a way to turn it into a natural phenomenon.